Strawberries are plentifully available this month, and I am making the most of the short season. Every time I step into the little supermarket near the apartment at Hyderabad, I see these small plastic boxes tightly filled with ripe red strawberries. Natasha looooves strawberries and is ready to make a meal of them, if she is allowed to do so. 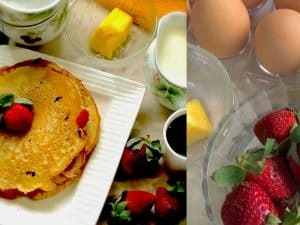 There are any number of recipes you can turn out from this tart and sweet bite of deliciousness, from salad dressings to savoury pizza and to pancakes (see the links at the end of this post) but did you know that they are healthy and nutritious too? 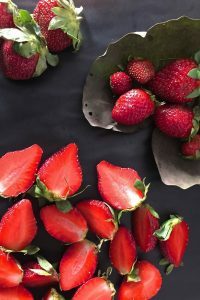 Strawberries are an excellent source of vitamins C and K as well as being rich in fibre, folic acid, manganese and potassium as well as having lesser quantities of other vitamins. 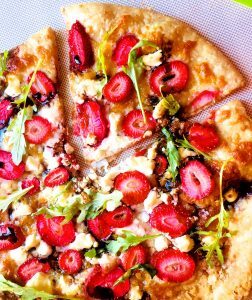 Strawberries are known to have been used throughout history as a medicine for digestive ailments, teeth whitening and skin irritations. 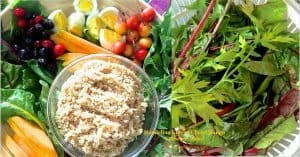 Their fibre and fructose content may help regulate blood sugar levels by slowing digestion and the fibre is thought to have a satiating effect. Leaves can be eaten raw, cooked or used to make tea. 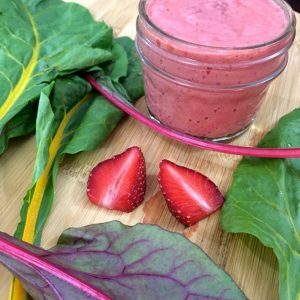 Certain studies have suggested that strawberry consumption may have beneficial effects in humans such as lowering blood LDL cholesterol levels, total cholesterol, reducing the oxidation of LDL cholesterol, and decreasing the spike in blood sugar after high sugar meals and the spike in blood cholesterol seen after high-fat meals. 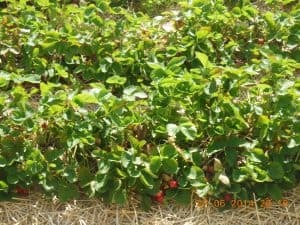 Strawberries contain significant amounts of phytonutrients and flavanoids which gives them their bright red colour. 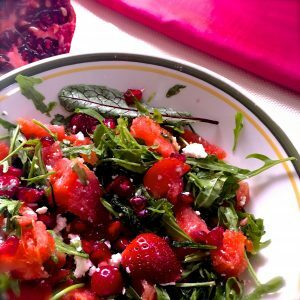 The vibrant red is due to large amounts of anthocyanin, which also means they contain powerful antioxidants and are thought to protect against inflammation, cancer and heart disease. 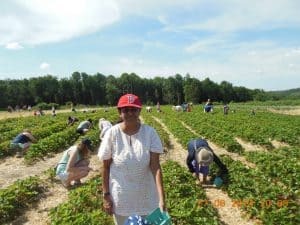 It was in June 2014 that I first experienced Strawberry Picking, at a farm in Connecticut. 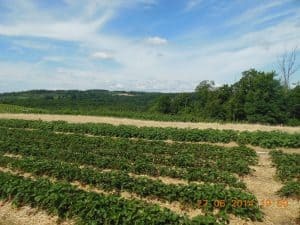 On that hot bright June morning, it was great fun to pick the berries from the neatly laid out rows of plants, and then to go back home and plan a host of recipes with the fresh fruit. I have finally made strawberry jam. Will post the recipe soon! This is fantastic! Beautiful photographs!